Membrane Autopsy: Why, When and How - American Water Chemicals, Inc.
Why do a Membrane Autopsy? Autopsies can identify specific foulants and scalants on the membrane surface, and they can determine the presence of chemical or mechanical damage that has occurred during operation. The data and conclusions from an autopsy can help identify the cause of the problem, which can in turn provide solutions to decrease or eliminate the operational issues. A membrane autopsy includes over 20 specific tests on membranes. Each test provides specific scientific data to identify and quantify fouling/scaling, or chemical/mechanical damage. The results of the different tests are then compiled by experienced chemists and engineers to draw a conclusion. Membrane autopsies are essential to every membrane plant. They can be performed on high pressure membranes like reverse osmosis (RO) and nanofiltration (NF), or on low pressure membranes such as microfiltration (MF) or ultrafiltration (UF). Performing autopsies on pre-treatment cartridge filters, or even SDI filters can also provide very useful information about contaminants entering the membrane system. If not controlled, fouling and scaling will lead to higher operational costs that could result in higher energy demand, increased cleanings, and reduced lifetime of the membrane elements. Chemical attack and physical trauma to the membrane surface result in irreversible loss of performance; identifying the problem at an early stage can help save millions of dollars in membranes before excessive damage renders them useless. When to do a Membrane Autopsy? Many sites utilize membrane autopsies as part of their routine system maintenance program. This provides the advantage of identifying any potential problems before they become unmanageable. However, in most cases, a membrane autopsy is only performed when a membrane is failing or underperforming. 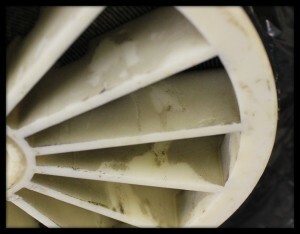 A noticeable loss in flow, permeate quality or visible fouling on the membrane itself would indicate a problem with the element and the need to have it inspected. 1. The lead element in the system will see the highest concentration of suspended solids. 2. The last membrane in the system receives water that has been concentrated and is the most likely to scale. 3. Biological fouling, and organics (such as humic acids) can be found on all membranes in the system. However, bacteria which are hydrophobic (water hating) tend to be attracted to the membrane surface which is also slightly hydrophobic. Biofouling is therefore always worst at the first stage where the bacteria attach to the first available hydrophobic surface that they find. By contrast, humic acids are hydrophilic at non-acid pH levels. They can therefore spread evenly throughout, or in some cases, even concentrate and cause heavier fouling at the tail end. 4. Suspended solids and precipitated metals (such as iron) can also end up on any membrane in the system. Therefore, if suspended solids such as limestone particles are found in a tail element, they can be confused for scale if a lead element is not also autopsied. How is a Membrane Autopsy Done? When the membrane is received at the analytical facility, a visual inspection is completed, photographs are taken, and detailed membrane condition is noted including the shipping and handling condition. Membrane Performance Testing is performed on each element or module using the same testing procedures used by the membrane manufacturer. The permeability and differential pressure are then compared to the membrane specifications to evaluate the “as received” performance. Next step is a mechanical integrity test. The membrane is completely submerged in water and 3 to 5 psi of air pressure is introduced into the permeate tube while the ends of the element are monitored for the presence of air bubbles. 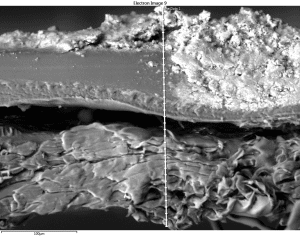 The samples are then analyzed using Scanning Electron Microscopy (SEM) with Energy Dispersive Spectroscopy (EDS). When used in combination, these instruments allow the user to determine the morphology (size and shape) as well as the overall chemical composition of a sample. AWC uses an additional analytical technique that is unique in the membrane industry and allows for even more detailed and accurate analysis of membrane foulants. Superimposed Elemental Imaging (SEI)™ and Prismatic Elemental Delineation (PED)™ visually distinguish the elemental composition of each compound on the membrane surface by providing elemental maps. The SEI™ and PED™ results are used in combination with results from EDS analysis to identify the exact chemical compositions of suspended solids, foulants and scales on a membrane surface. The use of these imaging techniques even identifies the presence of organics and biofoulants on the membrane, and determines whether existing scales and suspended solids are buried within biofoulants or reside on the surface. Dimensional Elemental Scanning (DES)™ analysis is used to determine the thickness of each foulant in a multilayered foulant/scalant matrix. In addition to providing cross-sectional measurements of individual elemental phases, this innovative technique even helps identify delamination of the membrane’s polysulfone layer from its non-woven substrate. Fourier transform infrared spectroscopy (FTIR) is then used to identify different types of chemical bonds. The molecular “fingerprint” of the material is then compared against a database. When these results are reviewed by an experienced chemist, even compounds that are not in an existing database can be identified. 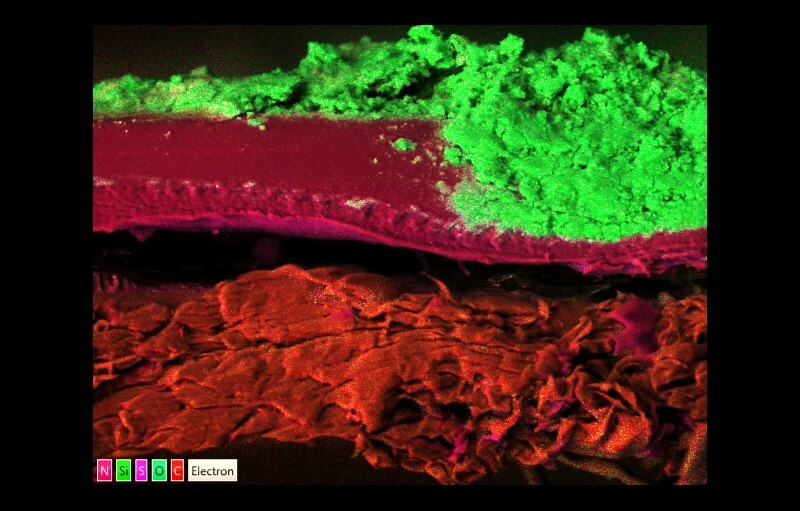 FTIR is extremely useful in identifying biofouling, antiscalant fouling, inorganic scaling, and even changes to membrane chemistry due to damage by chlorination. A biological activity reaction test (BART) is used to identify the general families of bacteria in a biofilm. This is a culturing method that encourages different organisms to grow using different types of nutrients specific to each BART test. When the BART tests are performed on biofilm rather than water samples, the population counts are only used comparatively to determine the most dominant types of bacteria. Finally, optical microscopy is performed by an experienced microbiologist to identify the types of microorganisms present on the membrane surface and to differentiate between to bacteria, fungi or algae. A good membrane autopsy report can accurately identify specific types of suspended solids, organics, microorganisms, and different types of inorganic scales. It should always include a conclusion that helps the plant owner/operator identify the cause of the problems, and provide possible solutions for their mitigation. These may include recommendations for changes to the cleaning protocol or alterations to the existing pretreatment program. The autopsy report is an invaluable tool whether it is performed for routine maintenance or to determine the cause of an ongoing operational problem.